A beautifully and uncompromisingly balanced big beer. Sweet & bitter; rich & dry; robust & delicate; strong & soft. Ganko Oyaji means ‘stubborn old man.’ Stubborn need not mean dour or curmudgeonly. The Ganko Oyaji of our label is mirthful and merry. And why not? He’s drinking a delicious Barley Wine! The key to brewing high gravity beers like a Barley Wine is to avoid excessive sweetness. High gravity means lots and lots of malt which naturally yields sweetness. This sweetness needs to be both controlled and balanced. High attenuation (i.e. high fermentability) is the key to control. 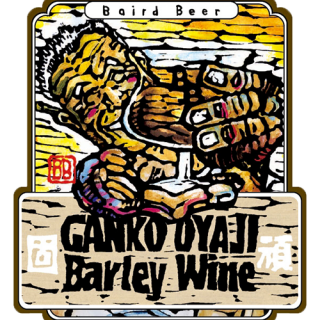 The following practices (all of which are incorporated in the brewing of Ganko Oyaji) contribute to high attenuation: (1) low and long mash temperature, (2) substituting highly fermentable sugar in place of a portion of the less fermentable malt, (3) high yeast pitch rates. Bitterness is the key to balance. We hop Ganko Oyaji aggressively with very impactful hop varieties. Alcohol warmth in the finish also will lend balance to inherent sweetness. When brewed thoughtfully and skillfully big beers are beautiful beers.